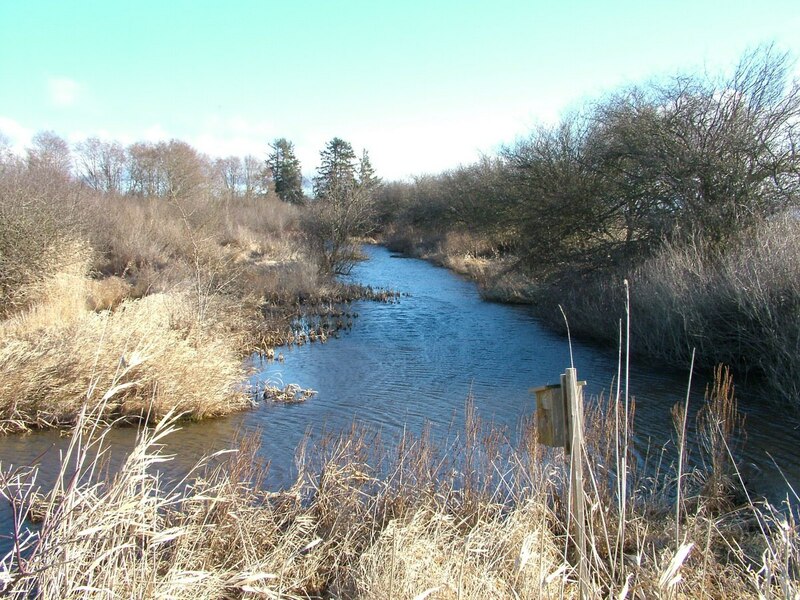 Before Bob and I barely got underway at the George C. Reifel Migratory Bird Sanctuary, we were shocked to see so much bird life populating the surface and banks of the first water channel along the walking trail. 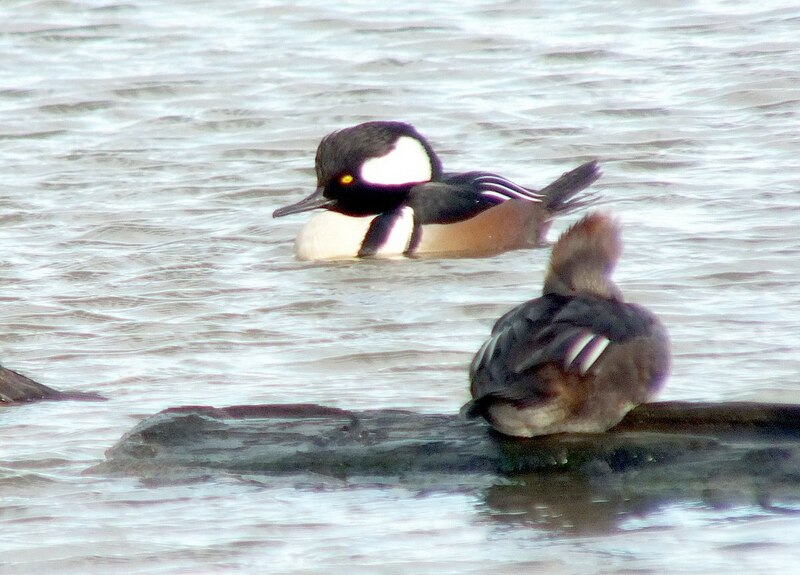 Numerous pairs of Hooded Merganser ducks plied the calm waters adjacent to the East Dyke. 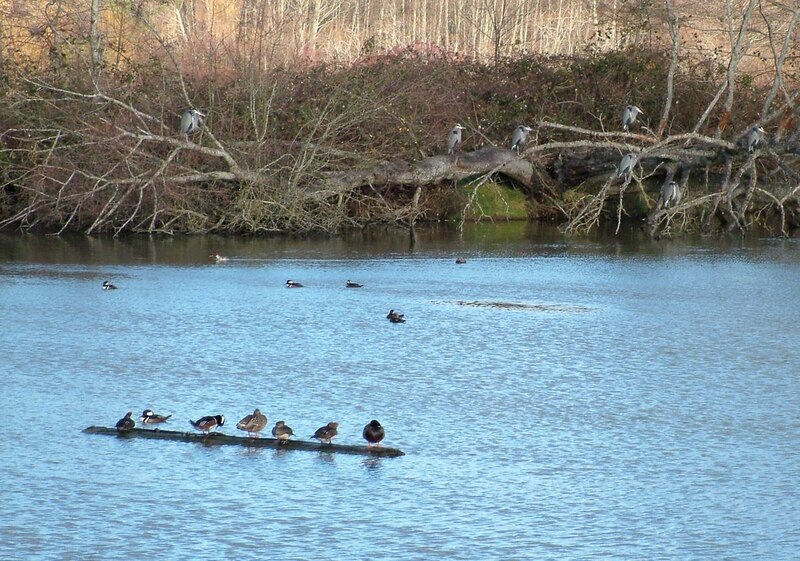 There, under the watchful eye of some 20 Great Blue Herons, the Hooded Merganser ducks busied themselves resting on a floating log, soaking up the sun as they floated along on the rippled water, or indulging in an occasional snack. 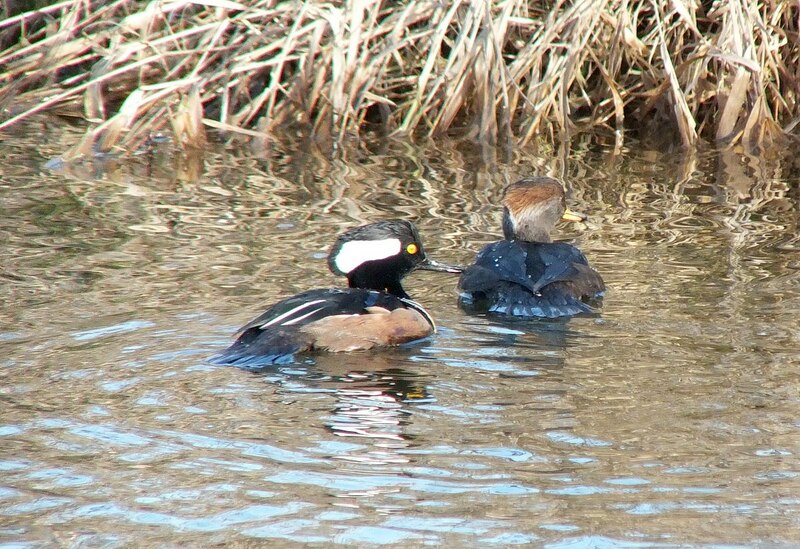 Hooded Mergansers are recognizable by the marvelous fan-shaped crest on the back of the head, a crest that, when expanded, reveals the white hood for which the birds are named. The crest gives the head an over-sized, oblong appearance. If a male is at rest or airborne, the white hood appears more like a fine white line behind the eye. When drakes are on the water, they are generally more alert which is evident by their expanded or fully-raised crests. That is when the elaborate white hood stands out against the black head. 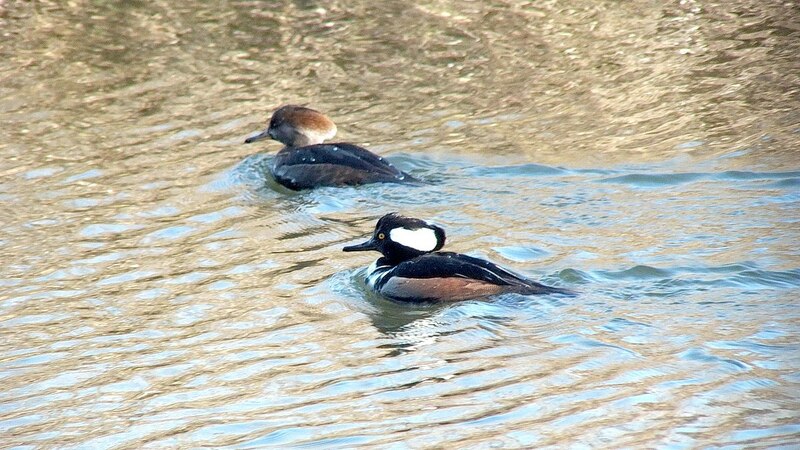 These adult male Hooded Merganser ducks are in full breeding plumage. They are stunning birds with sharp black and white patterns and rich chestnut flanks. 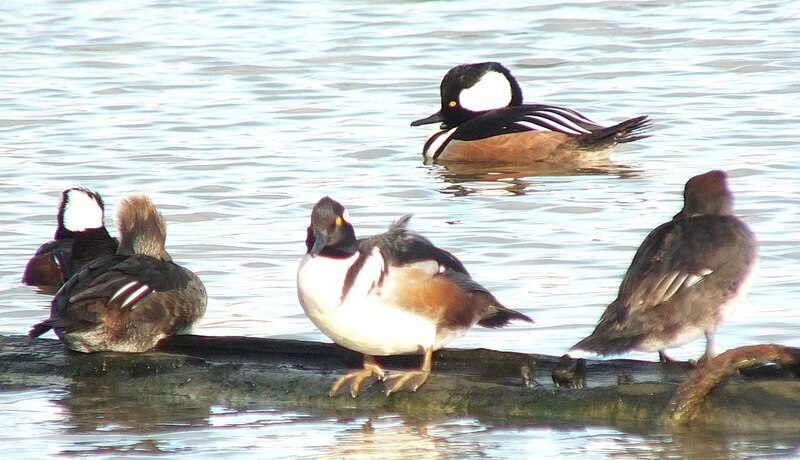 Other merganser ducks have red bills while the Hooded Merganser drake has a black bill. It was a real pleasure exploring Reifel Sanctuary because every step of the way, Bob and I felt that we were in some distant backwater far removed from urbanization. Around every corner, a new surprise awaited us in the form of bird blinds, observation towers, marshy islands, shallow ponds and intertidal marshes. 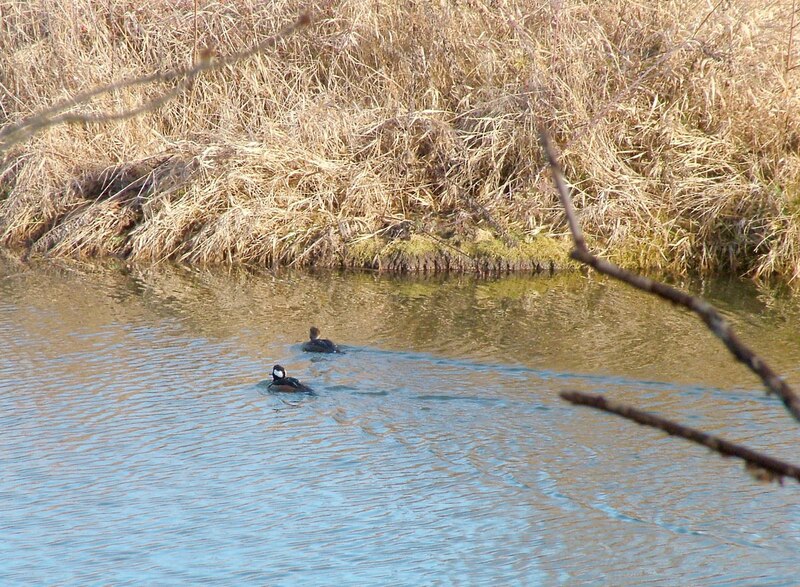 Actually, we came across Hooded Merganser ducks at a couple of locations in the Sanctuary, and here we see another pair coasting with the current while Bob and I peeked through a tangle of bushy shrubbery, barely able to find a clear shot through the twigs. I do believe that the mergansers were aware of our presence because they seemed to stick to the far side of the channel, but I was happy to have a pretty good view of both of them. The female Hooded Merganser also sports an impressive crest although it is cinnamon coloured and not as pronounced as that of the drake’s. The females are distinctly elegant, and of note is the fact that their bills are two-tone, dusky orange on top, and yellow below. 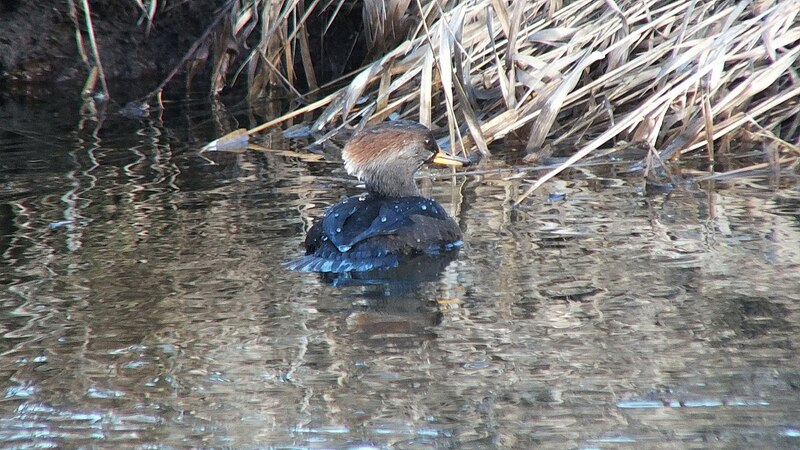 It is the slender bills of both the drakes and females that help to identify these birds as mergansers. 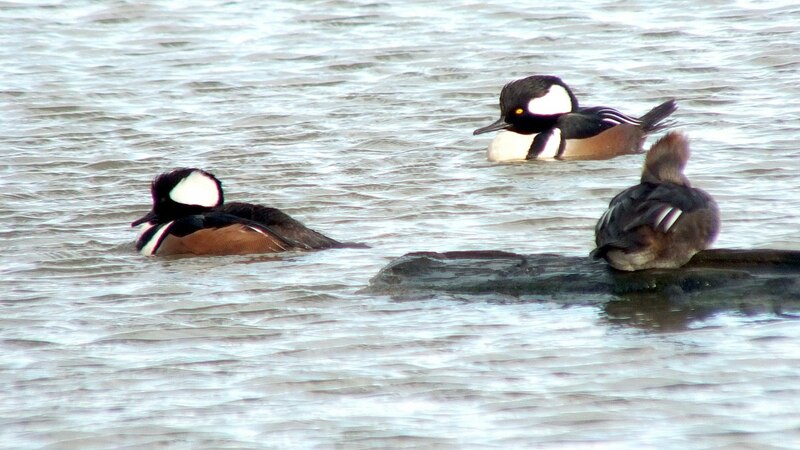 Hooded Mergansers are also referred to as sawbills because of their long, narrow serrated bills that serve them well to grip prey. They eat primarily freshwater fish, crayfish and other crustaceans. 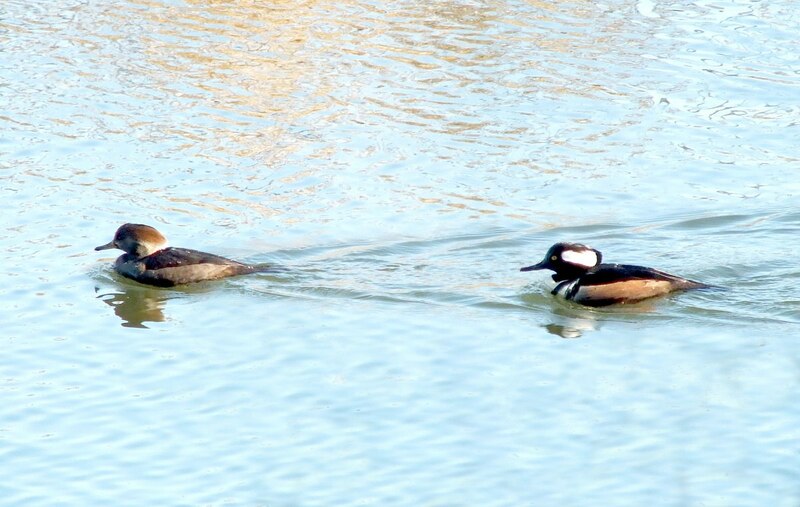 There are three species of mergansers in North America, Hooded, Red-breasted and Common Mergansers, but of the three, the Hooded Merganser ducks are the only ones that remain on the continent. Reifel Sanctuary provides the perfect winter habitat for these birds because of the brackish estuaries, marshes, tidal creeks and saltwater bays of the location. It is during breeding season that the male’s plumage changes colour. 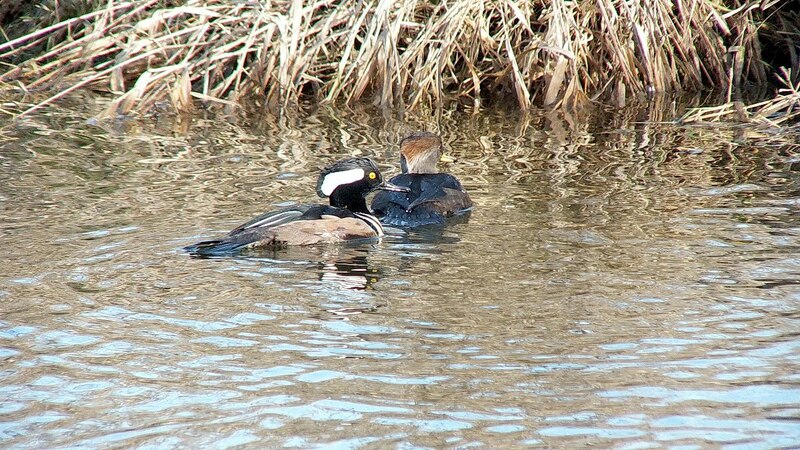 During the rest of the year, a drake looks almost identical to the female Hooded Merganser. The males use the extended white, sail-like crest to court females. I found it interesting to learn that Hooded Mergansers nest in tree cavities or even abandoned nesting boxes previously used by Wood Ducks. As long as they are near wetlands, their requirements will have been met.